Prescription mask? The first question you must ask when getting a prescription scuba mask is; do you really need one? At first this might seem like a stupid question, but underwater you will experience a 25% magnification as the light bends going from water, through the glass lens, through the air space in you mask and finally to your eye. This magnification means that some individuals do not need underwater lens correction. The second reason you might not need a prescription mask is you might be considering wearing contact lens. If you decide to use contact lenses, I would recommend double checking with your eye doctor. The older hard style lenses called PMMA or the RGP lenses can cause problems at depths. I have heard of individuals who had their soft contacts contaminated by the water. The advantages of contact lenses are when you leave the water and take off your mask; you can find your dive bag. 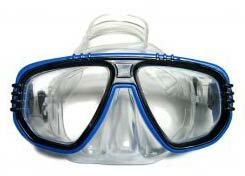 Divers with a prescription mask must keep their mask on until they find their regular glasses. Simple stick-on lenses. These are perfect if you just need some magnification added to your mask. These stick on lenses can be removed and reapplied. They use what the manufacturer calls "molecular bonding". You do not even need to own the mask, just apply to your rental mask and remove when you're done. Simple diopter lenses or pre-made lenses. This is where the whole lens acts as the correction, not just the bifocal part. These are very popular because each lens costs about $25.00 each and can be snapped into place if you have the right mask. If you have astigmatism, these lenses will not correct for it. If your astigmatism is minor, you probably can get by with these simple lenses. You need a full prescription. If you plan far enough ahead of time, just send your prescription into a company, such as Sea Vision. They will be able to quote you a price. Expect to pay up to $300 for your lens, depending on what you need. The down side is the expense. Very few divers keep a spare mask with their prescription handy during dive vacations. One last item is the newer color correcting lenses. I just bought one for the Pacific Ocean and I love it. The fish seem to be more vibrant in their shading and it gives me a whole new appreciation for the underwater world.